Today, a memorandum of understanding (MOU) was signed to foster collaborative research into energy, water and electricity issues in the Kingdom. Research under the MOU will focus on ways to boost energy productivity and promote innovation and efficiency in the water and electricity sectors in Saudi Arabia. 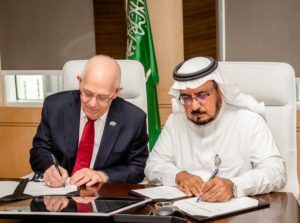 It was signed by the President of King Abdullah Petroleum Studies and Research Center (KAPSARC), Adam Sieminski, and HE the Governor of Electricity and Cogeneration Regulatory Authority (ECRA) Dr. Abdullah M. Al-Shehri. “The water and electricity sectors have always played an important role in the Saudi economy. With the ongoing global energy transition, many challenges will emerge. Our research collaboration with ECRA will ensure that, together, we can produce impactful research,” Adam Sieminski said. Under the MOU, KAPSARC’s Energy Transitions and Electric Power team will be working closely with ECRA’s team on a range of topics covering electricity demand, electricity supply, regional trade and innovations in electricity and water sectors. KAPSARC has a mandate to push forward the insight and understanding of energy challenges and opportunities, both domestically and globally, through high-caliber research in energy economics, policy, technology, and the environment, and to advance the knowledge of efficient and sustainable energy production and consumption to create future value and prosperity for humanity. ECRA is the national regulator for the electricity, gas and water desalination industries in Saudi Arabia. ECRA’s mission is to ensure that supplies of electricity, gas and water are adequate, reliable, of high quality and reasonably priced. ECRA also promotes the protection of the public interest and the rights of consumers and service providers.